CARIBIQUE® Villa Rentals Top 10 Guide to Christmas in the Caribbean 2014. If you’re looking to escape the chill this holiday season, here’s our travel picks for a very merry “Caribbean Christmas”. You may still be able to find some availability in Caribbean hotels and resorts, but if you’re hoping to spend Christmas and/or New Year in a private Caribbean villa, you’re really too late. Top destinations like the Turks and Caicos Islands were already fully booked for Christmas and New Year by February 2014. But, there's always next year, so start planning now. The Turks and Caicos Islands were voted the “World’s Leading Beach Destination” and Grace Bay Beach is regularly voted one of the best beaches in the whole world. If all you want for Christmas is an endless, soft, white, sandy beach and crystal clear sea, the Turks and Caicos is the perfect choice! In addition to the perfect beaches, there’s also the third largest coral reef system in the world with easy snorkelling right off the beach in Grace Bay. The large selection of great restaurants will ensure that you don’t miss out on the culinary delights of Christmas and the Maskanoo provides fun for the whole family. 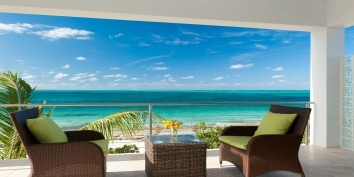 Find out more about the Turks and Caicos Islands and Turks and Caicos villa rentals. If you would like to experience two slightly different Caribbean cultures for Christmas, Saint Martin is a great choice. Saint Martin and Sint Maarten occupy the same island in the the Eastern Caribbean. The Northern portion of the island is French and is known as Saint Martin; the Southern portion is Dutch and is known as Sint Maarten. The island has volcanic peaks, white sandy beaches, gourmet French cuisine and is known for great nightlife. Perhaps the perfect location for a Caribbean Christmas party? We do have some last minute Saint Martin Villa Rentals Christmas Holiday Specials 2014. 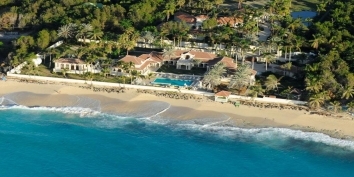 Find out more about Saint Martin and Saint Martin villa rentals. The culture of Jamaica is warm and inviting, and there is a definite distinctive celebratory vibe that is hard to resist. If you really want to celebrate Christmas, Jamaica is a superb destination. This large Caribbean island has everything a Caribbean island should have. White, sandy beaches lined with gently swaying palm trees, tropical rainforests, stunning waterfalls and reggae! Jamaica is a destination that always has something to offer everyone, as relaxing or active as you want to be, or a very healthy mixture of both. Find out more about Jamaica and Jamaica villa rentals. The islands are an unspoiled Caribbean hideaway and the ease of travel for US citizens (if you’re American, you don’t even need a passport to go) mean the islands are a popular destination all year round. If you’re looking for a tropical Christmas paradise that still feels just a little bit more like home, without the snow and ice of course, then the islands of Saint Croix, Saint Thomas and Saint John may be the perfect choice for you. Find out more about the USVI and US Virgin Islands villa rentals. The British Virgin Islands are just a little quieter, just a little slower and just a little more “Caribbean” than their US neighbours, but equally as beautiful. The islands are mountainous and lush with excellent harbours, making the BVI a very popular yachting destination. The majority of the population lives on the main island of Tortola, but Virgin Gorda, Anegada and Jost Van Dyke are great islands for a Christmas vacation. The New Year’s party at Foxy’s Bar on Jost Van Dyke is definitely one party not to be missed! Find out more about the BVI and British Virgin Islands villa rentals. Anguilla is the perfect choice for a quiet, romantic, Christmas vacation, but families will find the pace of Anguilla charming, and the abundance of watersports will keep anyone from getting bored! The people of the island are friendly and gracious, and visitors will find Anguilla very, very welcoming. The island boasts over 30 stunning white sand beaches, which are completely uncrowded even for the popular Christmas holiday season! If you yearn for old-world Caribbean charm, you’ll love Anguilla, but you can still celebrate in style in one of the spectacular restaurants. 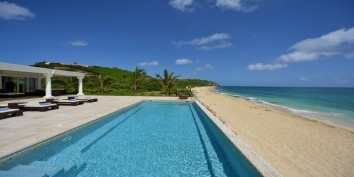 Find out more about Anguilla and Anguilla villa rentals. Due to the strong Spanish cultural influence, the Dominican Republic has a completely different rhythm to most of its Caribbean neighbours. There are many beautiful vacation destinations within the Dominican Republic, and the island is most famous for large all-inclusive resorts catering to Europeans and North Americans. However, the Dominican Republic is a very diverse destination with some of the best beaches, surfing and golf to be found anywhere in the Caribbean. Find out more about the Dominican Republic and Dominican Republic villa rentals. With 108 square miles, Antigua is a relatively large island. It’s also different from some of its neighbours in that it boasts a peak elevation of a respectable 1,319 ft. With annual rainfall of just 45 inches, Antigua is the sunniest of the Leeward Islands. Antigua is said to have a beautiful beach for every day of the year, but visitors to this unique island will also be impressed by the historical buildings and fortifications of English Harbour and Nelson’s Dockyard National Park which once housed the British fleet. Find out more about Antigua and Antigua villa rentals. Is it St. Barts or St. Barths? Officially it’s Saint-Barthélemy and it’ the most European (and more specifically French) of all the Caribbean destinations. St Barts has long been considered a playground of the rich and famous and is known for its beautiful pristine beaches. If you want to mix with the jetset, enjoy chic restaurants and high-end designer shopping, then St Barts is the Caribbean Christmas destination for you. Find out more about St. Barths and St. Barths villa rentals. Often referred to as “Helen of the West Indies”, Saint Lucia is an island of outstanding natural beauty. Geographically diverse, the island has mountains, rain forests, verdant valleys, plantations and magnificent volcanic sand beaches. African, British and French influences have all created a unique cultural mix. St. Lucia is a great location for a completely relaxing or very active Christmas holiday and will particularly appeal to nature lovers. Find out more about Saint Lucia and Saint Lucia villa rentals.